We are extremely proud of the bespoke kitchens that we produce at Langfords in Stourbridge. 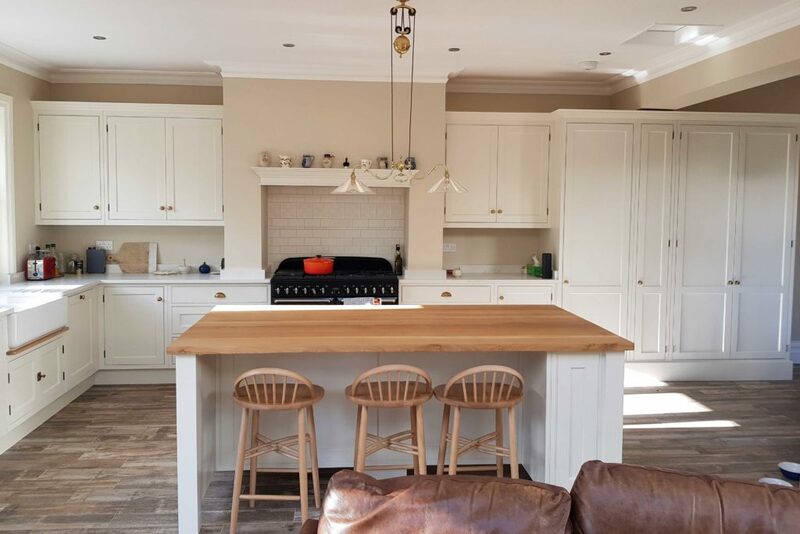 All kitchen carcasses are handmade from solid wood using traditional methods of construction. You will see from the images provided, that we specialise in a wide range, be it contemporary or traditional kitchens. As always, the design, fitting and final kitchen will be made according to your requirements, with as much or as little design involvement from us as needed. The majority of work surfaces we are use are granite and accessories are of the highest quality sourced from trusted suppliers that we have had a long and good relationship with over the years. As always, each bespoke kitchen we make is unique down to the design, layout and finish etc. 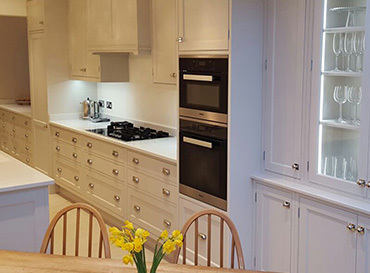 We offer a bespoke painting service to colour match your kitchen to any colour request; or if you prefer a more natural lacquered finish is available which shows the natural beauty of the wood. 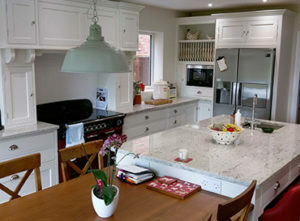 Our customers are very often surprised at the excellent value for money that our bespoke kitchens provide, we are constantly doing price comparisons with High Street retailers and we are proud to say that we very nearly match all on price and are more superior on quality due to the fact that we use solid timber, granite etc. For a better idea on our bespoke kitchen prices please see some examples below. We are more than happy to come and visit you to measure up then provide a no charge quotation. If you intend to have the kitchen fitted yourself, we provide a supply only service on all our bespoke kitchens. If you would like to spruce your kitchen up by simply adding new solid doors and handles to your existing units please let us know the measurements you require and we can get a quote done for you. You will not find solid wood kitchen units any cheaper as these are our trade prices, the total price includes delivery of fully assembled ready to install units, we are happy to work with your own kitchen fitter or indeed recommend a kitchen fitter to you. All we need from you are your kitchen measurements and your deposit then we can start hand building your kitchen! If you would prefer us to visit and take the measurements ourselves that's no problem - we are happy to do this for a small consultation fee. Our Bespoke Furniture Company in Stourbridge currently covers the following areas, but are not limited to: Belbroughton; Birmingham; Bromsgrove; Clent; Cheltenham; Coventry; Dudley; Gloucester; Hagley; Halesowen; Kidderminster; Kingswinford; Redditch; Stourbridge; Solihull; Telford; Walsall; West Bromwich; Wolverhampton; Wombourne; Worcester. A professional service, with a personal touch, offering a FREE bespoke furniture design and quotation service. Completely bespoke, unique furniture; designed, constructed and fitted specifically for you. Excellent quality and value for money that is far superior than anything you will find on the High Street. Durability, we only ever use high quality and solid materials that are built to last, and are carefully sourced from our reliable suppliers.